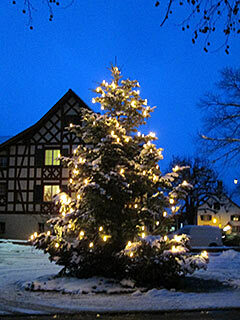 Demonstrate the arrival of Advent to guests and passers-by from outside the house. This stylish eye-catcher will be noticed because it's both unusual and sophisticated. You need two people to set up this decoration. 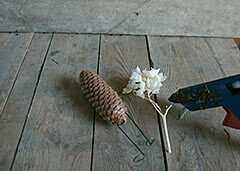 Polystyrene hemisphere; black paint spray; pine cones; black annealed wire; pliers; decorative star; metre-long wooden logs; thick natural rope (e.g. coir rope); winding wire. Spray the polystyrene hemisphere with black paint in such a way that no light patches will show through after the pine cones are attached. Take the pine cones in your hand and wind wire once round the middle by pressing the wire between the scales, then crossing it over at the end and pulling it tight with pliers. 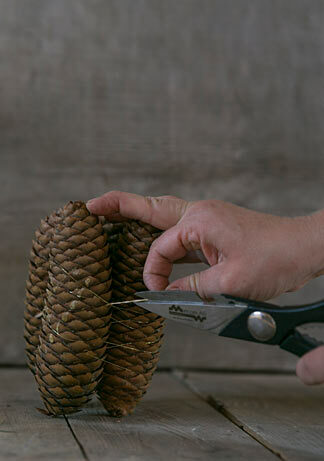 It is best to put the cones outside in the open air overnight when it is cold and damp so that the scales close and you can work with the pine cones side by side. Then, for each cone, push the two ends of the wire into the polystyrene hemisphere. Start at the bottom and end up with the cones on a slight slant towards the top. Repeat until no polystyrene is visible as far as possible. When you then put your "work of art" outdoors, you have a guarantee that it will look good in any weather: when it's cold and wet and the scales of the cone close and also when the weather is nice and the scales open. 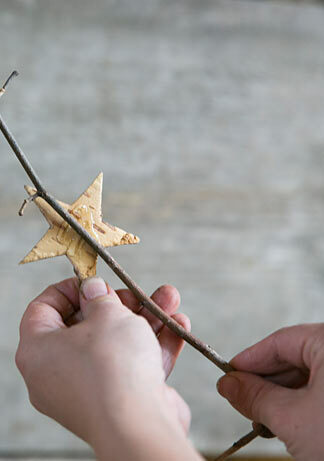 Now go to the position where you would like to place the decoration and, together with another person, make a bundle of the wooden logs. While one person holds the wood together, the other ties it with the rope: the rope is wound two or three times around the logs at the top and bottom and then tied in a knot. 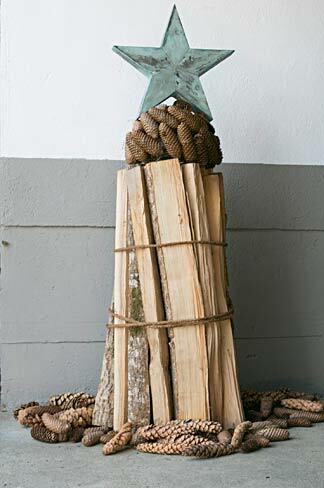 Place the hemisphere of cones on top of the bundle of wood, decorate the whole with a star if you like and secure both with winding wire. 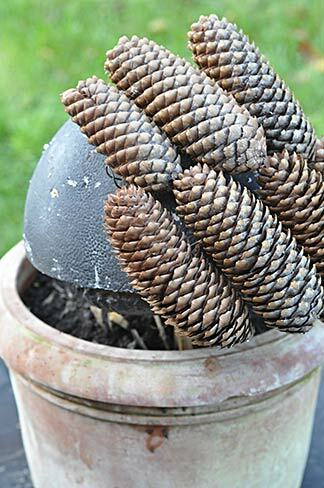 The pine cone hemisphere also looks good on a pot filled with soil. 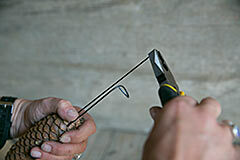 To secure it, insert one end of a rod into the flat side of the hemisphere and the other end into the soil. 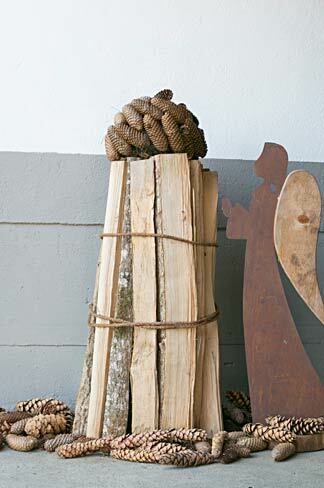 You can also decorate the log bundle with fresh flowers or plants in the warm season. 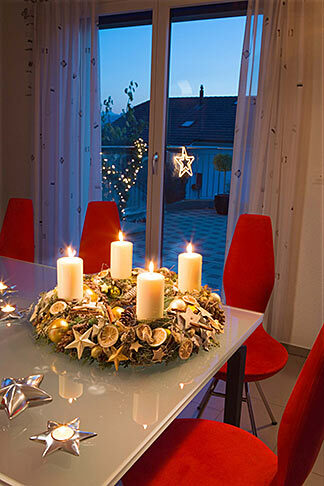 Want to know more about indoor and outdoor decorations? You'll find our LED special HERE. 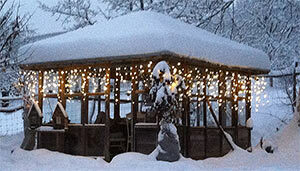 We also have decorations for outdoor use. The shop is HERE. 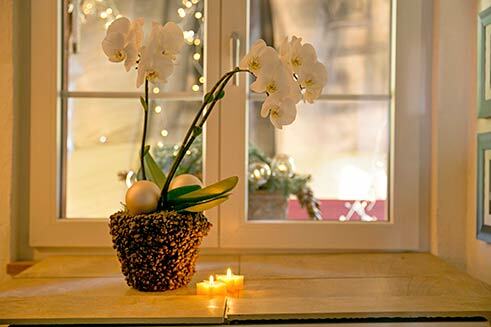 Orchids are one of the most popular plants to buy, especially at Christmas time. These decorating tips will make sure that the planter is an eye-catcher as well. Cover the work table with plastic so that it does not get dirty. 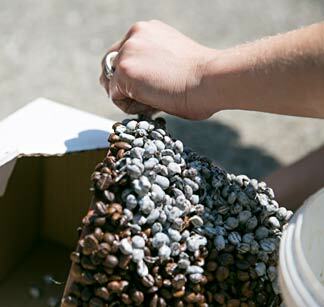 Mix the coffee beans with the white glue in an old container. Don't worry if everything appears white. The glue becomes transparent when it dries. 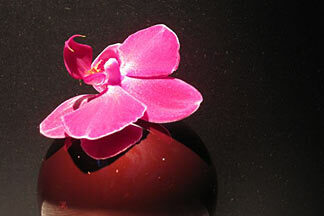 Place the orchid pot on the table with the open end down and apply the coffee bean/glue mixture gradually. Take care not to use too much at once, and wait for a little while each time until the layers dry slightly. If you apply too much, there is a risk that the whole thing will slip. Finally, close any gaps with individual beans. 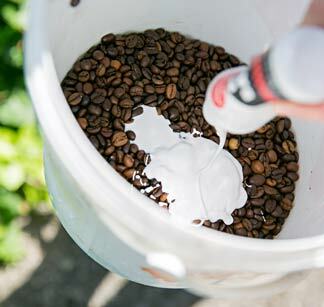 If the coffee bean/glue mixture dries out during the waiting periods, add a little water. 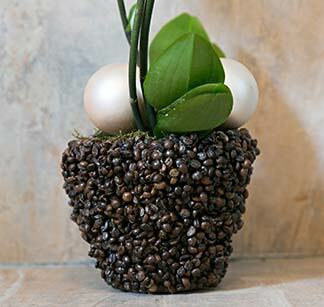 Instead of a Phalaenopsis, you can also use this attractive coffee bean planter for other plants. 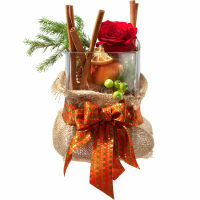 If you like to make your own gifts, friends and acquaintances will definitely be pleased with this original holder. 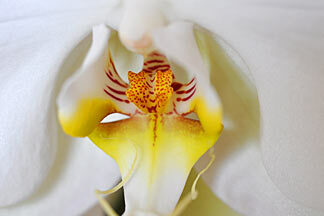 More about orchids? You'll find our special HERE. Find creative articles for the best of all seasons on our website. The shop is HERE. You don't always have time to create elaborate decorations. We've got something that's really simple and can be made in a flash. 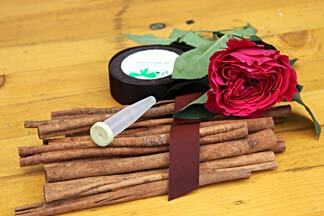 Cinnamon sticks; satin ribbon; a test tube and rose (or Christmas rose). 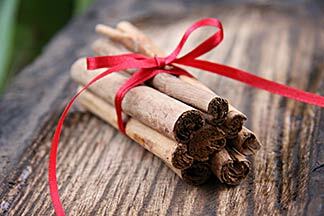 Tie about 8 cinnamon sticks into a bundle with a pretty satin ribbon. 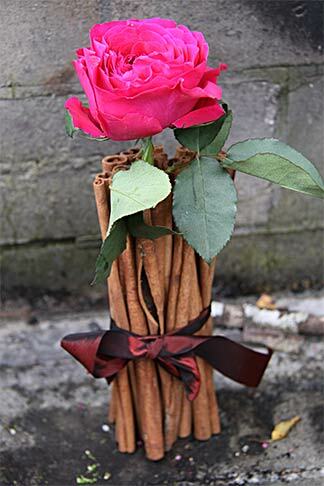 If your taste runs to "flowery", insert a test tube filled with water into the middle of the cinnamon sticks and place a rose (or Christmas rose) in it. This little eye-catcher doesn't just look good on its own as a table or plate decoration, but also does well anywhere, including arranged in rows. 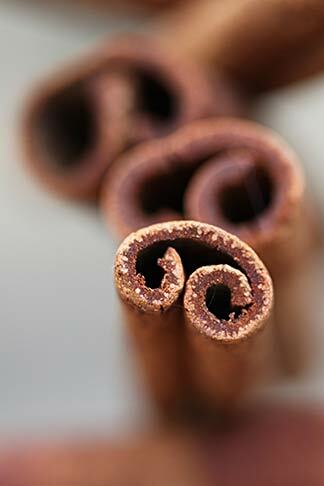 Cinnamon is connected with Advent and Christmas more than virtually any spice. 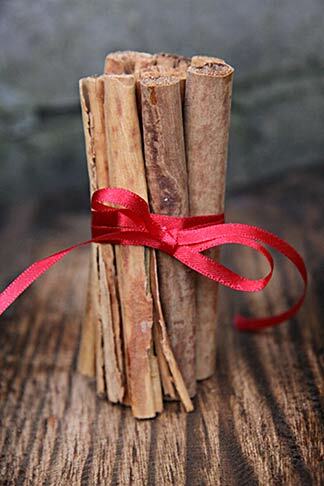 It’s best to use decorative cinnamon sticks that don't crumble so easily. 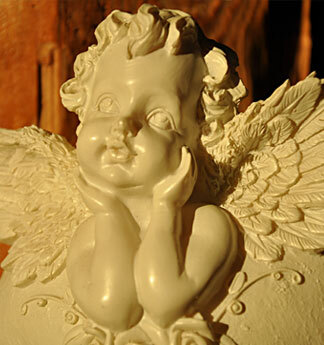 You can also order ready-made decorative elements HERE. 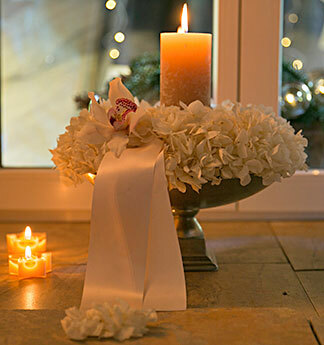 Sophisticated, harmonious and extremely decorative: hydrangeas have a strong impact even in Advent, particularly if you use them in monochromatic style (in single colours) We're going to tell you how to make a hydrangea garland, which is the basis for a very wide variety of decorations. Garland base of floral foam (e.g. 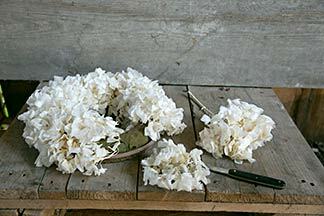 Florinchen); white hydrangeas (stabilised or dried); clips; hot glue. Hydrangea blossoms are made up of many umbels that are joined at the stems. Divide the hydrangea blossom so as to leave the stalk on the umbel if possible. Next, attach the individual umbels to the garland base: select the longer stems for the outside, the shortest for the inside, and reserve the most beautiful umbels for the middle. Insert the stems of the umbels into the garland base. If the umbels don't stay in place properly, fix them with additional clips. 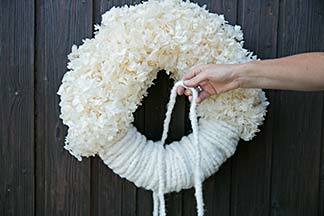 Make sure you achieve a nice, even garland shape. 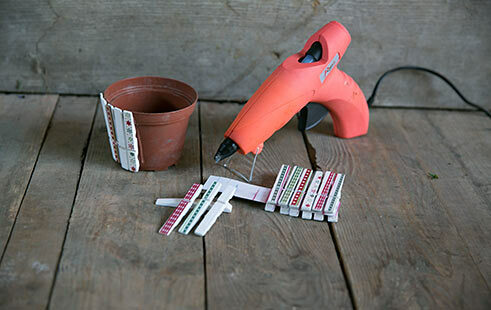 If the garland base shows through in a few places when you're finished, close any gaps with individual umbels or whole blossoms by gluing them in place. The same applies if the garland shape hasn't turned out quite straight and you have to even it up a little with added blossoms or umbels. 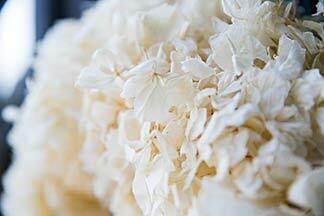 Hydrangea garlands can be used in many different ways. We'll show you some attractive variants later. The professional's Advent worlds are HERE. Door garlands for Advent are nothing unusual. 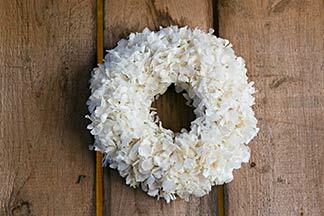 However, a white hydrangea garland on your apartment or house door is likely to attract real attention. It looks sophisticated even on rustic wooden doors and makes people curious for more. 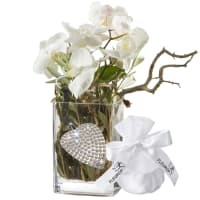 Hydrangea garland (as described above); wide satin ribbon; hot glue; clips; white hydrangea; nylon thread or decorative wire; real or artificial Phalaenopsis flower if liked; test tube with lid if liked. Cut off a piece of the satin ribbon at least twice the diameter of the garland in length and attach it with hot glue to the lower edge of the back of the hydrangea garland. To secure the ribbon, attach an additional two clips on the right and left. 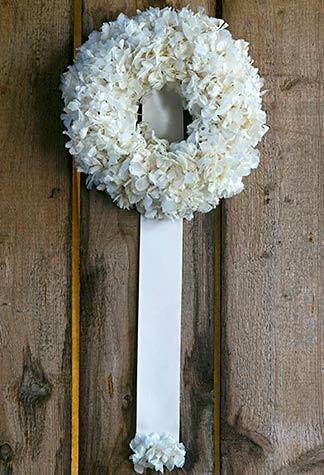 Divide up the hydrangea into individual blossoms and attach a few to the end of the ribbon with hot glue to form a border. 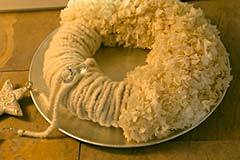 Make a hanger with nylon thread or decorative wire and hang the garland. 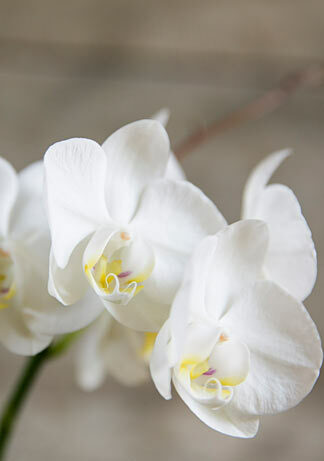 You can also attach the satin ribbon on the back of the garland at the bottom edge and decorate the ribbon with a real or artificial Phalaenopsis flower. 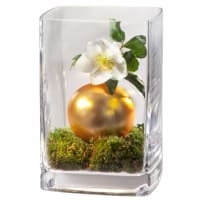 You can attach an artificial flower to the garland with hot glue, but it is best to place a real flower in a test tube with a lid, filled with water, and insert this into the garland base. 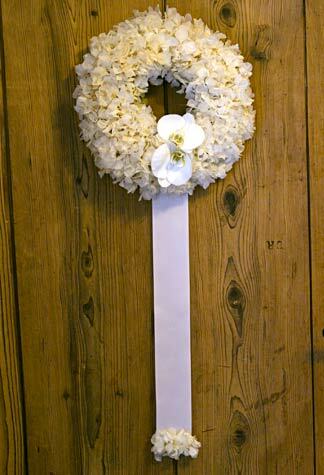 Hydrangea garlands with or without ribbons also look good on a wall (e.g. concrete or slate wall). 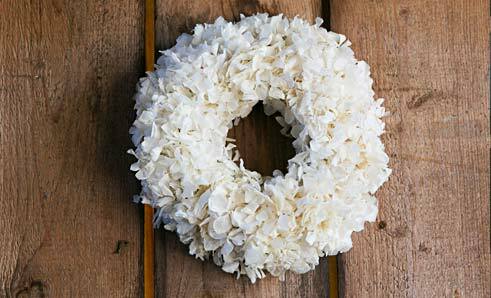 Please note: garlands made from dried or stabilised hydrangeas are not suitable for outdoor use because of the weather (dampness, wind). 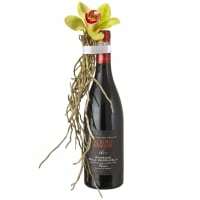 You can also buy Advent garlands. The shop is HERE. 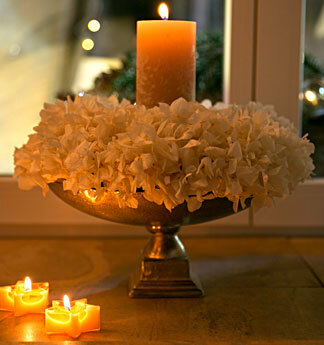 You can also place a candle on a plate or bowl (with or without a stem) with a hydrangea garland, and really show it off to best advantage. 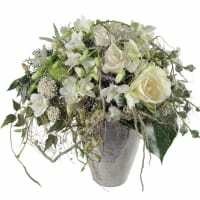 Bowl (with or without a stem) or flat plate; hydrangea garland (as described above); sand; candle; any accessories such as wide ribbon, Cymbidium orchid, angel or star; hot glue if needed. 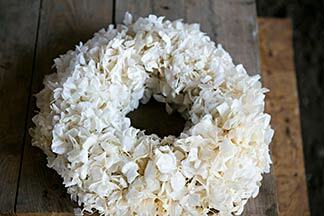 Place sand on the plate or in the bowl and lay the hydrangea garland on it. 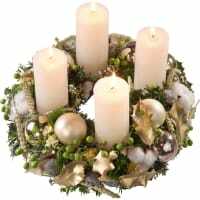 Place the candle in the centre of the garland on the sand (the sand will hold the candle steady and catch any dripping wax). Purists will probably be satisfied with this version. 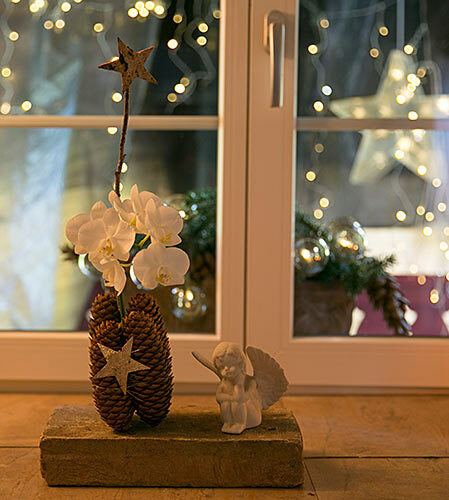 If you like something more lavish, you can also decorate the garland with ribbon, an orchid flower or accessories such as a star or an angel. Fix these in place with hot glue. 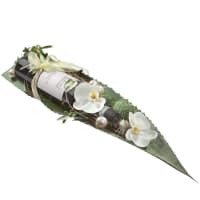 If you use an orchid flower to decorate the garland, you should place it in a test tube with lid and insert this into the garland. Never leave burning candles unattended. 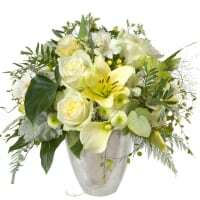 And: choose good quality candles like Fleurop's partner florists do. These are usually made in Switzerland. Although they are often a little more expensive, they burn for much longer and more evenly. In addition, they don't drip and smoke so much. More about candles? You'll find our candle special HERE. 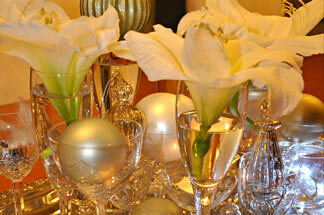 You'll find atmospheric elements with candles and garlands of lights HERE. More and more people are orchid fans. 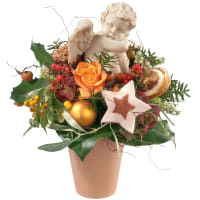 Existing planters can be prettied up for the Festive season accordingly. But take a look for yourself. 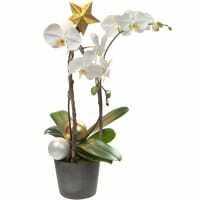 Phalaenopsis plant with planter; hydrangea garland (as described above); Christmas tree baubles; wire. 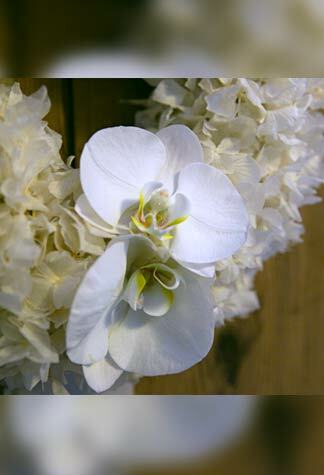 Place the Phalaenopsis plant in the hydrangea garland in such a way that the garland frames the upper edge of the planter. 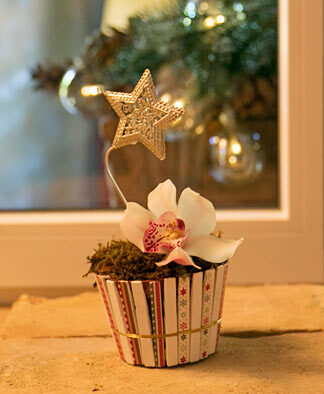 Decorate the plant itself with a few Christmas tree baubles by attaching some wire to their hangers and inserting the wire into the orchid's soil. 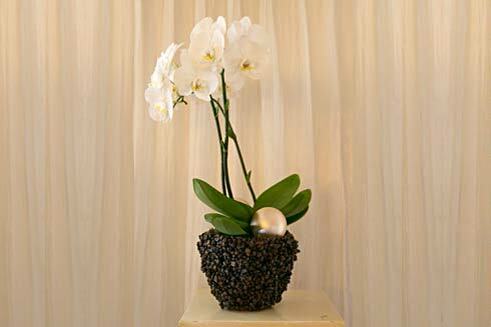 If you choose the same colour for the hydrangeas, orchids and planter, the overall effect is particularly sophisticated. More about orchids? 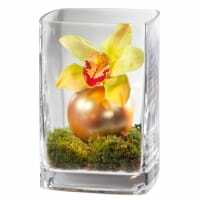 You'll find our orchid special HERE. Sometimes it's a mix of materials that creates that certain something. As in this garland, for example, which consists of two thirds hydrangea flowers and one third woollen cord. 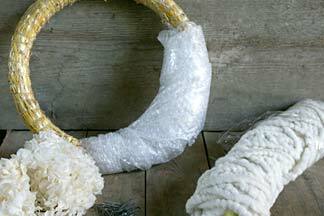 Straw garland base; stabilised white hydrangeas; bubble wrap; winding wire; white woollen cord; clips; Christmas accessories (e.g. 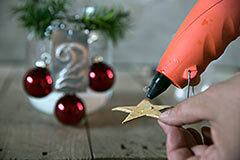 stars); hot glue and decorative wire if needed; nice plate. Wrap one third of the straw circle in bubble wrap to give it some volume and fix the wrap in place with winding wire. Next, cover the bubble wrap with the woollen cord. Take care to make the curve even and clearly recognisable. Now deal with the hydrangeas. They consist of a large number of umbels that are joined at the stems. Divide the hydrangea blossom so as to leave the stalk on the umbel if possible. Attach the individual umbels to the garland base with clips. Select the longer stems for the outside, the shortest for the inside, and reserve the most beautiful umbels for the middle. 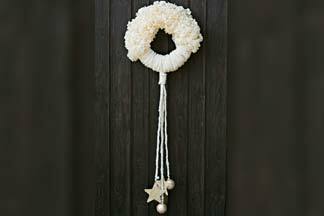 You can glue the Christmas accessories directly to the garland with hot glue, or attach them to the woollen cord with decorative wire. 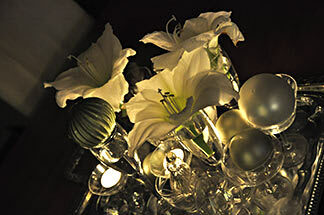 Place this unusual garland on a plate (plain and self-coloured if possible; matt silver is particularly effective). If the garland base shows through in a few places when you're finished, close any gaps with individual umbels or whole blossoms by glueing them in place. 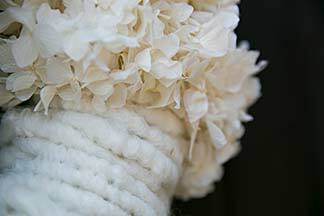 Hydrangea and woollen cord garlands can be used in different ways. We'll show you another variant later. 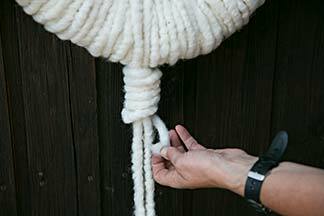 We'll show you here how to turn the hydrangea and woollen cord garland described above into an anything-but-ordinary decoration for a door or wall. Hydrangea-woollen cord garland (as described above); woollen cord; hot glue; Christmas accessories (e. g. baubles, stars, etc. ); decorative wire. First, cut off 2-3 pieces of woollen cord. As the pieces of woollen cord are placed over the bottom end of the garland in such a way as to hang down at the back and front, each piece has to be twice as long as you want it to finish. 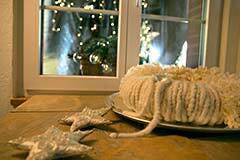 Make sure that the final length of the longest cord is about twice as long as the outside diameter of the garland. 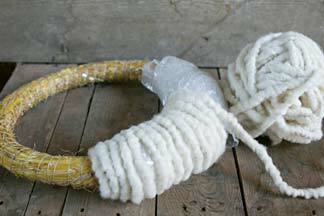 Make a nice finishing touch with a short piece of woollen cord by wrapping it around the upper end of the hanging cord 4-6 times and fixing the end in place with hot glue. 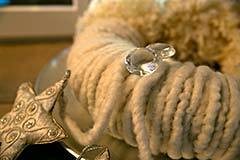 Attach the accessories to the end of the woollen cords with decorative wire. Use different motifs, shapes and sizes for the accessories so that it doesn't look dull. You want lights and up-beat elements for Advent? The shop is HERE. 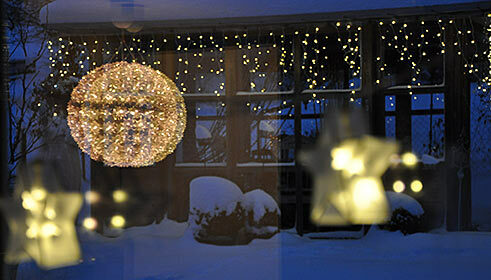 For atmospheric decoration of façades, trees, entrances and balconies, LEDs are ideal. 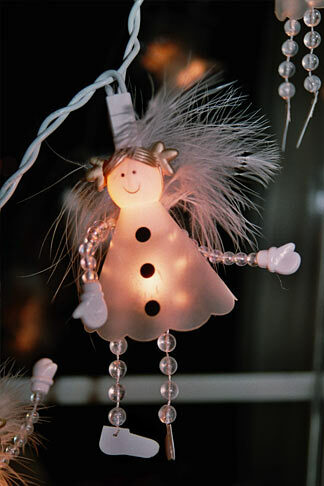 They're energy-efficient, create less heat and have a much longer life than conventional garlands of lights. Even the light quality is good nowadays. Because you have the choice between cold, warm and even very gentle light. 1. Check that the lights you have selected are really intended for outdoors and connect the garlands of light briefly to the socket to be sure that they work. 2. Make sure you put the electric cables firmly in place so that they are flat and protected and that no one can trip over them. 3. As far as possible, select a cable that is long enough for you to plug in the power supply unit indoors, or at least to a sealed outdoor power supply unit. 4. Always use a waterproof safety box for outdoor cable connections. 5. Ensure the transformers are powerful enough and observe the manufacturer's instructions. 6. 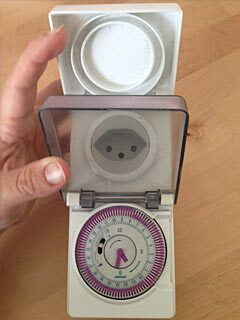 Invest in a timer, and make it a model on which you can set different on and off times. That way, for example, you can get into the right mood in the morning from 6.00-8.00 am when you get up, and will have the company of Christmas glitter in the evening from 5.00 pm to midnight. 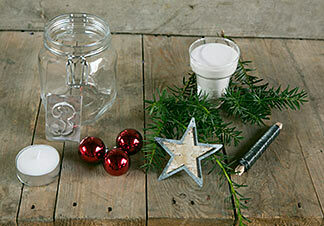 You'll find atmospheric elements with candles and lights on our website: HERE. Plan the indoor and outdoor sections together so that they harmonise in style, complement each other and so that their look flows from one area to another. 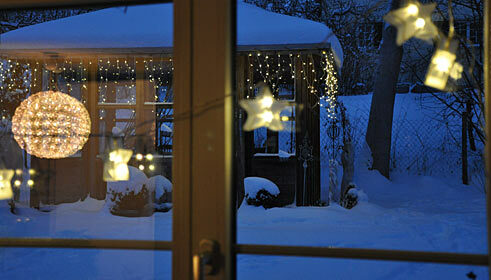 For example: if you have illuminated stars hanging in the inside of the window, they're visible from outside. So they automatically also become part of the external decoration. Be aware of that fact and use it. Select the same colour tone for all the lights. 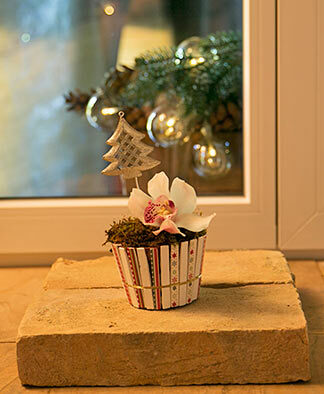 When decorating the outdoor part, be aware that you will also see your fairyland in the garden when you look out of the window. Tip: Above all, remember that the windowpanes will amplify the effect because of the reflection and use this fact. 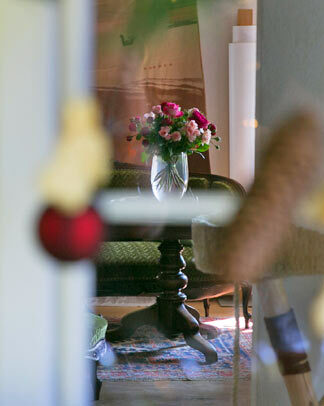 Don't create a fragmented effect but concentrate – depending on the size of the garden – on 1-3 points. These points can, however, be treated lavishly. Don't be mean. There's no harm in the extra garland of lights. Work carefully. A straight line should be really straight, a curve regular. Light mercilessly emphasises every crooked line and the effect lacks harmony. Tip: Use the existing lines and don't ignore them in your decoration. Work systematically and symmetrically and use geometric forms. 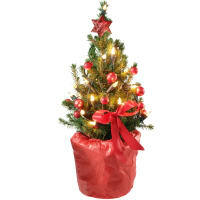 Touching briefly on trees and shrubs: identify the top (or the highest point) before decorating. If it's very high, you can take it down. 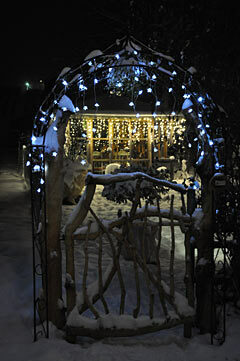 Then follow the contours meticulously with your garlands of lights. The important thing is to get the outline and symmetry right. Then you can't go far wrong. Tip: You're best to set the whole thing up in the afternoon when the sun isn't too strong. Don't hesitate to keep switching on the lights while you're working. If you screw your eyes up, you'll soon see the things that could do with further improvement. Children aren't the only ones who love Advent calendars, adults do too - even if calendars for adults normally look a little bit "different". One stunningly beautiful option is the one with the Christmas tree baubles. Materials: Approx. 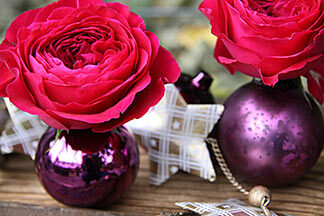 40 Christmas tree baubles; washers; 24 slips of paper; orchid or Christmas rose blossoms. 1. 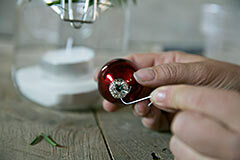 Remove the hangers from the baubles and glue the baubles to the washers to make them more stable. 2. Write good wishes, declarations of love or vouchers (for doing the washing up, a good dinner, extra kiss, etc.) on the slips of paper, roll them up and place them in 24 of the baubles. 3. 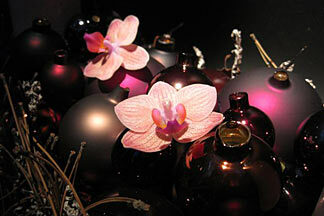 Fill the remaining baubles with water and orchid or Christmas rose blossoms. 4. Place the baubles on a nice tray .... and there you have it. The countdown to the Christmas festivities can begin! 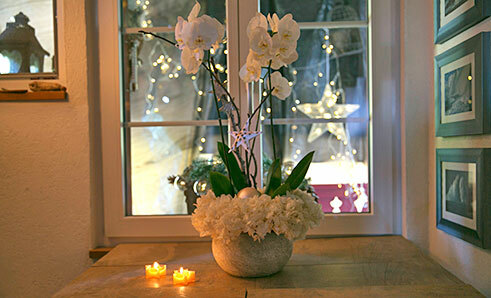 Tip: Christmas tree baubles filled with flowers also look effective as a table decoration (and a gift if you're paying someone a visit), particularly at Christmas dinner. 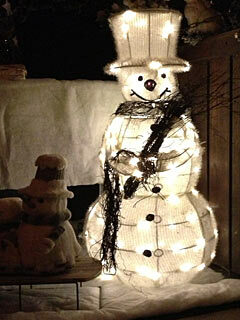 You'll find our suggestions on pre-Christmas decorations HERE. Large garlands are becoming more and more popular. Here's our tip for an especially attractive eye-catcher in XXL format. 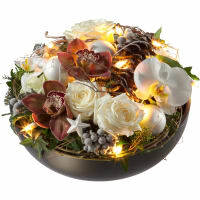 Materials: Very large garland base (up to 1 m in diameter, e.g. mourning wreath); 4 large candles; wire for candles (1.6 - 1.8 mm thick, depending on the diameter of the candles); lots of pine cones; wire for cones (1.2 - 1.4 mm thick); hot glue; accessories such as Christmas tree baubles, Carline thistles, stars, dried orange slices, etc., for decoration. 1. First, fix the candles to the garland base (see tip). 2. 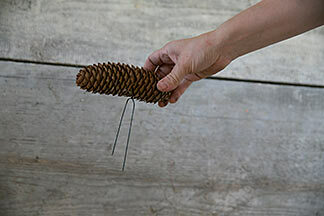 Attach wire to all cones: pick them up with the pointed end down, press the wire into the lower third between the scales, then cross it over and pull it tight with pliers. 3. 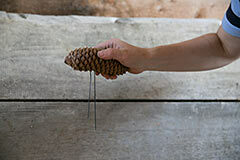 Insert the two ends of the wire on either side of the cone into the garland base so that the cone stands straight - with the point upwards. 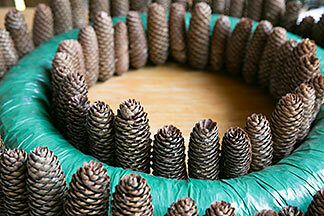 Continue with the remaining cones until the entire inner and outer side of the garland base is covered with upright pine cones. 4. 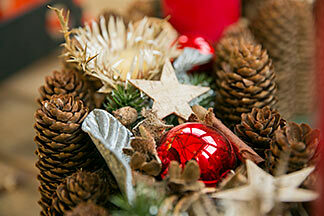 Next, finish decorating the garland base between the pine cones and candles. It is best to fix your favourite accessories in place with hot glue. Start with the largest and fine-tune with the smallest. 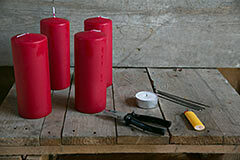 Tip: To "anchor" the candles firmly in the garland base, cut 10 cm long pieces of wire, 2-4 (depending on the diameter of the candles) for each candle. 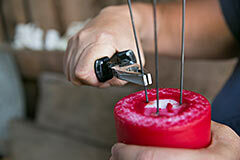 Heat 2-3 cm of the wire end over an ordinary candle and insert it 2-3 cm deep into the base of the candles. 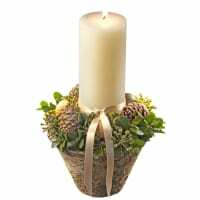 Make sure that the wire is absolutely straight inside the candle and is also inserted vertically in the garland base, otherwise it won't hold firm later on. To ensure that it is firm, grasp the candle with both hands and push the wires that show underneath it downwards into the garland from above, with all the strength and pressure you can muster. 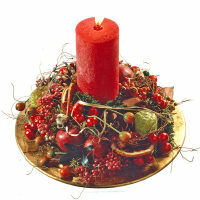 Once the first candle is in position, place the second one directly opposite the first. 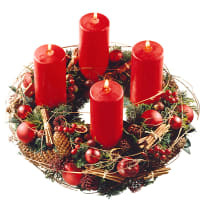 The two other candles are then placed as exactly as possible in the middle between the two first. 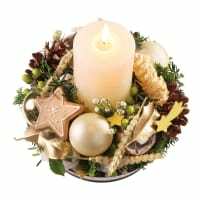 If the candle wires are visible on the bottom of the garland base, bend them into a U shape with the pliers and press them into the garland base. 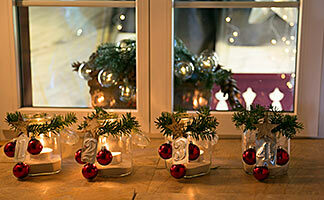 You'll find our care tips for Advent garlands HERE. 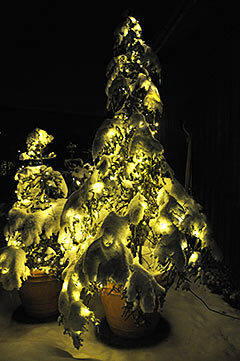 You'll find our care tips for Christmas trees HERE. 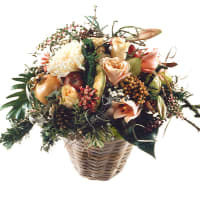 You can also purchase Advent garlands and Advent arrangements: HERE. When you aim to create magical worlds, you're always in search of surprise effects. 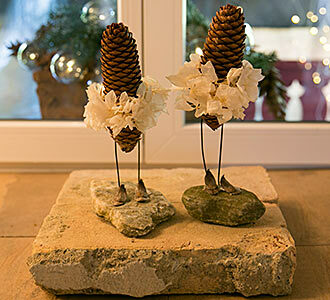 You're unlikely to see anything like our fir-cone vase elsewhere. Not only that, it's also quick to make. 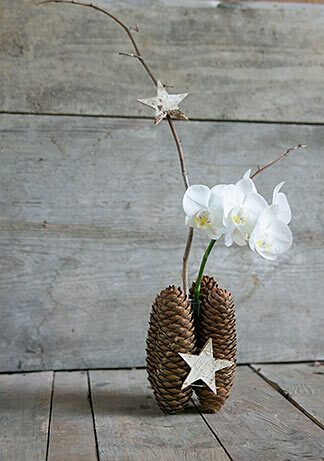 Materials: 4 pine cones; rubber band; gold-coloured decorative wire; test tube; orchid flower; 1 twig; 2 stars (made of straw or bark); hot glue. 1. Fix the 4 pine cones (point upwards) with a rubber band and place the test tube in the centre. 2. 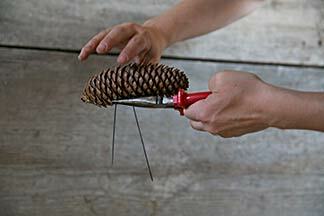 Wind the gold-coloured decorative wire a few times around the cones and fasten. 3. The rubber band, which doesn't look pretty, is no longer needed and can be removed. 4. 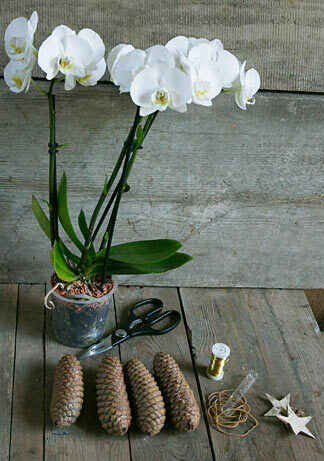 Insert the twig between the cones and put water and an orchid blossom in the test tube. 5. 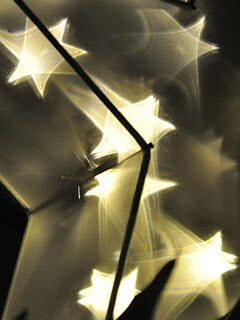 Finally, the stars: attach one to the gold-coloured wire with hot glue, the other - also with hot glue - to the twig. 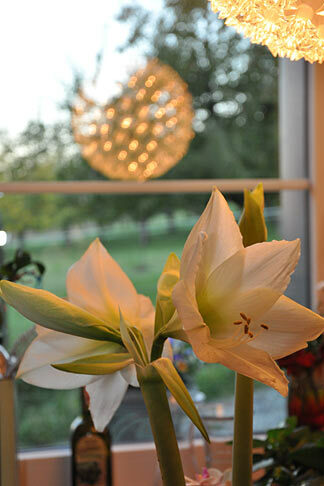 Tip: This charming little vase is particularly effective if you stage it with an angel or a candle. You will also find creative articles for the best of all seasons HERE. Talking about surprise effects: your friends and acquaintances will adore our latest little decorative idea. Don't be surprised if they copy it. 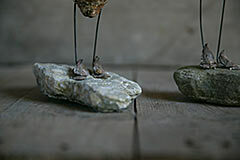 Materials per ballerina: 1 spruce cone; a few scales from a white pine; 2 pieces of 1.8 mm thick wire; stabilised or dried hydrangea; stone; hot glue. 1. 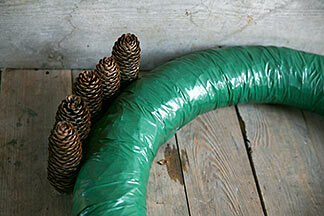 Insert both wires into the bottom end of the spruce cone. 2. Make the ends of the wires into a loop with pliers. These are the feet. 3. 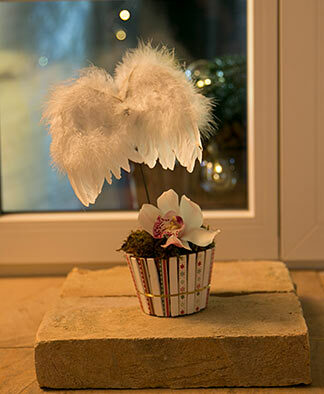 Attach the hydrangea flower to the bottom half of the cone with hot glue to form a tutu. 4. Next, fix the little ballerina firmly to the stone with hot glue. 5. 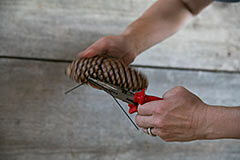 To ensure that the hot glue and the wire feet, which are not pretty, cannot be seen, cover them with scales from the white pine cone and fix them in place with hot glue. Tip: Ballerinas are effective on their own or in pairs (e.g. 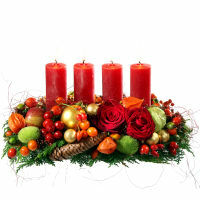 in niches) or in a row as a graceful table decoration. You can count the days in Advent ... or the weeks. We chose the latter option for this Christmassy tip. 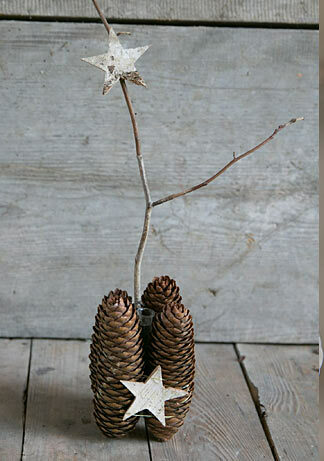 Materials: 4 preserving jars; decorative wire; 4 tea lights or other candles; sand; a little periwinkle (evergreen foliage); Christmassy accessories such as Christmas tree baubles, stars, etc. ; embossing foil; embossing pen; thick nail or pruning shears. 1. 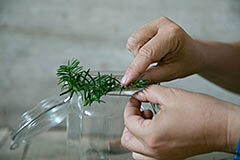 Tie the wire loosely around the rim of the jar and attach the evergreen foliage, baubles and other accessories to it at different heights (not too much, otherwise you get a busy effect). 2. For the numbers of the Advent weeks, look for images of the numbers 1-4 on the Internet and print them out. 3. 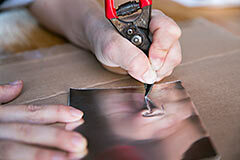 Next, lay them - one after the other - on the matt side of the embossing foil and trace the contours with an embossing pen (or a thick nail, pruning shears, etc.) 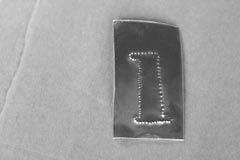 in such a way that the number can be seen in relief on the front of the foil. 4. Cut out the numbers in "label format" so that they are all roughly the same size. 5. 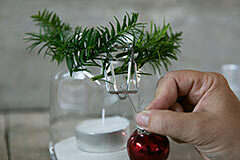 Make a little hole in them and attach them to the decorative wire. 6. 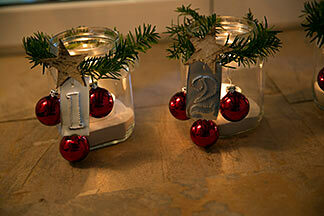 Place sand and a candle into the jar and Advent can come any time! Tip: If you would like to treat yourself or your family to something sweet every day, you can fill another four preserving jars with biscuits, Christmas tree chocolates, etc. You will also find atmospheric elements with or without candles HERE. December is a time for clever little notions. Here's one for you. 1. Separate the two parts of the clothes pegs and attach them all around the plastic pot with hot glue. 2. 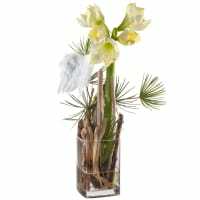 Place the plastic film and floral foam (soaked with water) in the pot, cover it with moss and insert a large orchid blossom (e. g. Cymbidium) into the moist floral foam. 3. 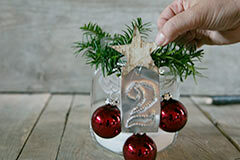 As a crowning touch, cut a Christmassy motif out of embossing foil (e. g. a star, Christmas tree, etc. 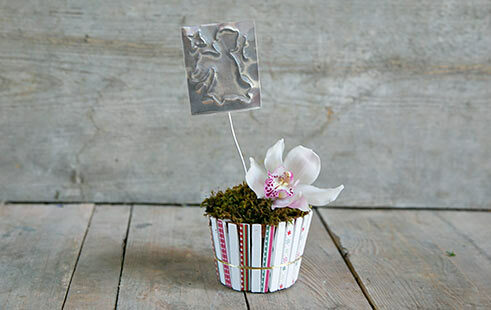 ), attach it to the wire with hot glue and insert it carefully into the "orchid muffin". Tip: You can also tie a satin ribbon round these muffins and then put them into a nice bowl or onto a slate slab as a portable decoration – just like real muffins. 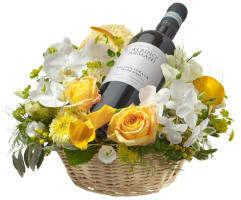 We also offer surprises. The shop is HERE. 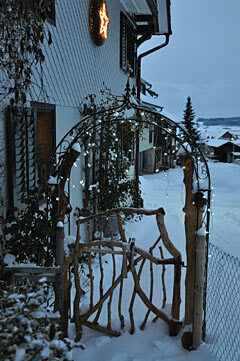 At the fireplace, window or door archway: garlands are atmospheric and effective anywhere. 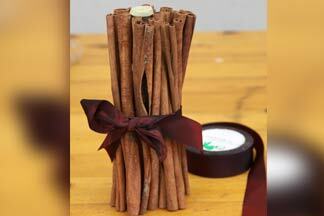 Because people are always asking us for tips that are quick to make, we've come up with an artificial garland. 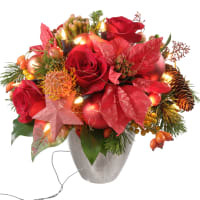 Materials: Artificial garland with lights; decorative wire; Christmas accessories such as baubles, stars, etc. 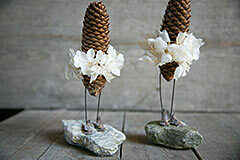 ; conifer cones; biscuits made of salt dough. 1. First, attach wire to all cones. Pick them up with the pointed end down, press the wire as far up as possible, between the scales at the thick end, then cross it over and pull it tight. 2. 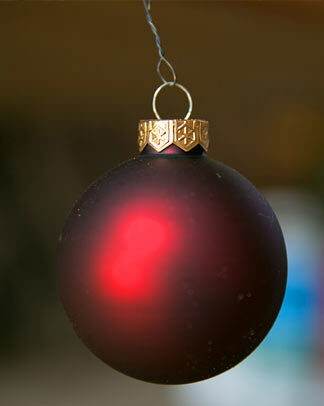 Fix the hangers of the Christmas tree baubles with a little hot glue. 3. 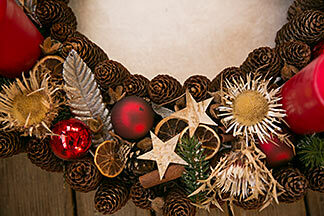 Hang alternate cones and baubles (likewise with decorative wire) on the garland. 4. Now it's time for the salt dough biscuits. 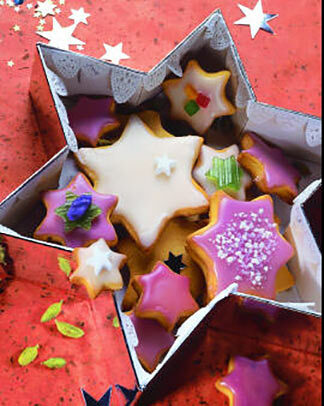 Don't forget - if you make them yourself - to make holes in the biscuits so that you can hang them up. A drinking straw is useful for punching these holes. 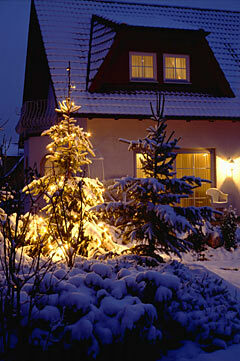 Tip: To make sure the lights are working, plug them in briefly before you decorate. 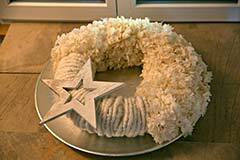 Glaze the salt dough biscuits if the garland is intended for outdoor use. Otherwise, the high salt content will attract water from the air and make the dough crumbly. 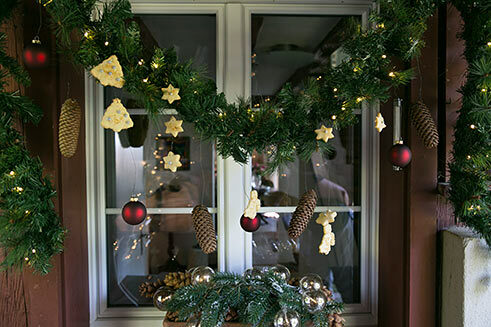 If you are using the garland inside the house, it's nice to hang up Christmas tree chocolates. You'll find our Advent worlds HERE. 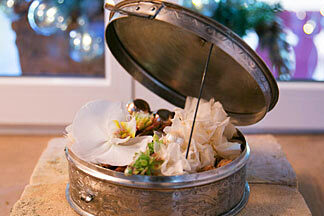 It's the tiny, loving details in a decorative arrangement that people often love. In search of a new idea for you, we came across an old jewellery box made of old silver and transformed it into a sophisticated eye-catcher with little effort. 1. 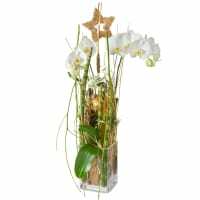 Put a little water and the orchid blossom (e. g. Phalaenopsis) in the test tube and place it – e. g. along with a piece of dried hydrangea – close to the front edge of the box. 2. Next, fill the rest of the box with any festive accessories you like. 3. Fix the lid with wire inserted between the box and the lid. 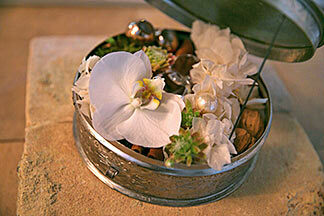 Work with flat decorative material in the lid area for preference. Tip: This lovingly filled box also makes a nice packing box for a valuable little Christmas gift such as a pendant, ring or similar. 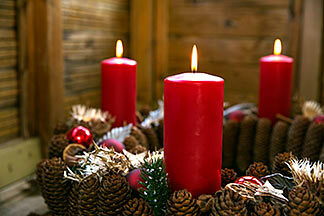 You will find Advent suggestions from our professionals HERE. Whether it's for the living room, dining room, conservatory or kitchen: a tray decorated to suit the event's mood that you can move around at liberty and whose decorative elements can be constantly refreshed or whose colours can be adapted to the occasion is practical and easy to make. 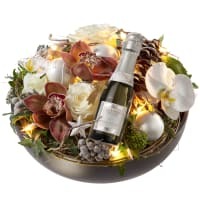 Materials: 1 nice tray; crystal glasses of different shapes and sizes; rose, orchid, amaryllis and/or poinsettia or Christmas rose blossoms; Christmas accessories such as sand, conifer cones, baubles, etc., and - an absolute essential - tea lights. 1. Place the glasses on the tray. 2. 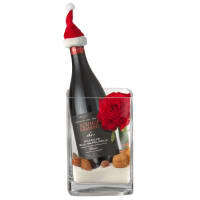 Fill some with blossoms or flowers and water, the remainder with Christmas accessories and tea lights. Tips: Decide on one or two colours, otherwise the overall effect may be busy. 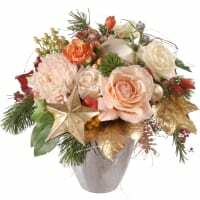 Make sure that the colours chosen harmonise with the interior decor and other decorations, and replace wilted flowers promptly with fresh ones. 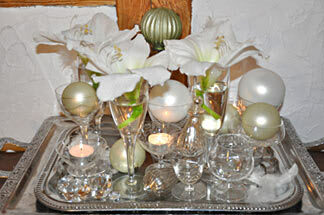 A few Christmas tree baubles and tea lights among the glasses on the tray are effective. Talking about colours: these can be changed from occasion to occasion.